Bier Haus is one of the popular WMS video slots. which you can encounter in land based and online casinos. 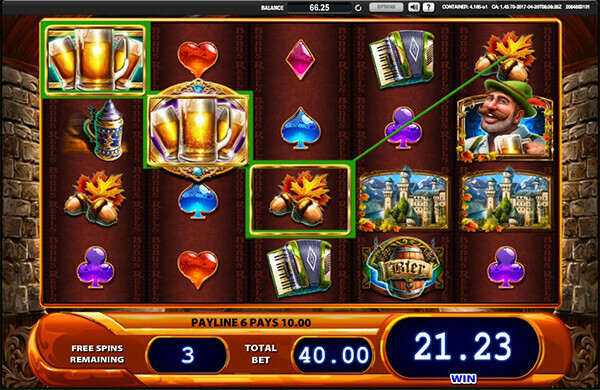 Due to the popularity of the original title, WMS launched additional Bier Haus slots, including a Colossal Reels game. (see the video below). Here we will review the original Heidi’s Bier Haus slot machine. It is played at a 5×4 reel set with 40 fixed paylines. The game obviously created with beer lovers in mind. It awards up to 80 free games during which players can benefit from so-called Persisting or sticky Wilds that turning into Wild Feature symbols and substituting for all symbols including Scatters. Inspired by beer culture in Germany and Oktoberfest, the game will provide you with a highly entertaining gaming experience during which you can win up to 20,000 coins in a single spin. The WMS title takes you to a German Bier Haus where you can enjoy a lively atmosphere, quality beer and beautiful waitresses. The reels looking as if made of deep green cloth are populated with symbols designed in bright colours including a cheerful Bavarian guy, castles, beer barrels, mugs, accordions and acorns. These are high-value symbols while the rest of positions are filled with spades, hearts, clubs and diamonds. Once you enter the Bier Haus slot, you will be overwhelmed by its atmosphere, yet we have to admit that the overall appearance of the game is mediocre. 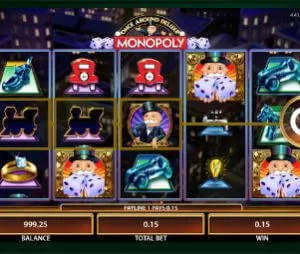 After all, it is another WMS title from the G+ Deluxe series originally produced for land-based casinos and turned into an online video slot. Wild is represented by three beer mugs and it appears on all the reels to substitute for all the symbols bar Scatter. Scatter or the Feature symbol is portrayed as an attractive blonde bar maid in a traditional Bavarian dress. Another special symbol is Gold Feature or Scatter depicted as the same blond waitress in the golden frame. To trigger the free spins feature, you need to land 5 or more Scatters or Gold Scatters on adjacent reels starting from the leftmost reel. The good news is that Scatters can appear in stacks and each Scatter appearing on the reels contributes to the triggering combination. Landing any 5 of these special symbols grants 5 free spins. Each triggering symbol above the initial 5 ones awards 5 extra free games up to 80 free games. If Gold Feature symbols have contributed to triggering the feature, these symbols will turn into so-called Persisting Wilds and remain in their positions till the end of the feature. Persisting Wild counts for all symbols except for Scatter and Gold Scatter. When Scatter or Gold Scatter overlays Persisting Wild and it can retrigger the feature, it will turn into so-called Wild Feature and replace all the symbols including Scatters and Gold Scatters during the current spin. The most lucrative symbol in the Heidi’s Bier Haus slot machine is the Bavarian guy awarding 500 coins for a five of a kind combination landed on a payline. Other high paying symbols award between 150 and 100 coins for five symbols of a kind. The game comes with 40 fixed paylines, so all you have to do before you set the reels in motion is to choose your bet. It can be anywhere between $0.40 and $40 per spin. With a 96% RTP, Bier Haus is a highly volatile game, so get ready to play it for a while before you trigger the free spins feature and hit a big win. If you are looking for a less bumpy ride, you can check additional WMS titles, such as OMG! Kittens or Cool Jewels slots.